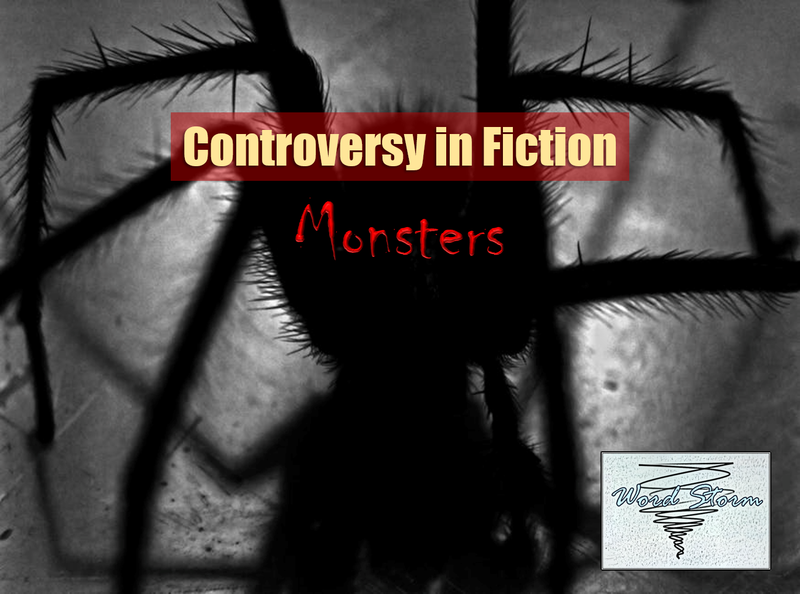 Welcome back to my mini-series, Controversy in Fiction. Each post can be read separately and in no particular order, as each one explores a different topic. This week, for October I’ll discuss monsters. You’re welcome for the creepy picture. Do you feel tiny feet crawling up your arm? I’m not much into horror books or thrillers, but I have picked up an occasional supernatural thriller. (Relax, Mom, you recommended them to me.) And let’s face it, it’s hard to read fantasy novels without running into a monster or two every now and then. As there are so many different types, I’ve decided to sort them by categories. What’s so controversial about monsters, you might ask? Depending on the genre, readers might start to wonder how necessary they really are. Disclaimer: This post may contain controversial opinions that are not necessarily the same as those of readers. I’m not here to talk about clowns, witches, or wizards. This post is strictly about non-human creatures. You don’t have to go far to find a monster in the natural world, and I’m not just talking about the spider living under your bed. (Please don’t freak out! I don’t know where the spiders live in your house.) And when I say natural, most of the monsters in this section are fictional. One particular monster that makes for some interesting stories are kelpies, a Scottish mythical creature also referred to as the water horse. Doesn’t sound familiar? The Loch Ness monster is one such beast based off kelpies. Aside from The Water Horse, I haven’t found a decent story about the Loch Ness monster. I now accepting book recommendations. Another good example of a natural type is the monster from A Monster Calls. Literally, that’s what it’s called—the monster. (Maybe it’s not as original of a name as the capaill uisce, but at least I can spell monster!) While most parents wouldn’t want their kids reading a book about monsters, this one is part narrative, part graphic novel. And it’s not just about a creepy tree, it’s about grief and truth and stories. Arguably, the monster from this book could fall under supernatural monsters, but I have listed him under natural monsters 1) because he is the embodiment of a yew tree and 2) because he does not have many the spiritual connotations aside from grief. You could probably add dragons to this list. Then there’s the debate of which is the real monster—the animal or the human. Most people will go with the human. Here we start delving more into the darker side of fiction. But I think we can all agree that experimentation to create monsters never ends well. In Frankenstein, the novel’s namesake brings to life a being which he refers to as the Creature or the Monster. Yes, the creature is ugly, but aside from his ugly appearance, he’s not monstrous. Not at first. This book, I’d say is the poor results of what happens when one is called a monster too often—that’s what they become. Yes, arguably, you could say the monster in this book came from a human, or multiple humans, but I have labeled him under experiments as he was not made of his own consent. However, there are experiments that truly are monstrous. Take the mutts in The Hunger Games for example. In the film, they were just mutations bent on killing. In the book, they were made from the bodies of the slain tributes. That’s right. Rue was among them. Talk about creepy. Not to be confused with monsters made from experiments, monsters that come from humans or other sentient beings tend to be a willing participant in their change. Of course, there’s going to be some overlap, so feel free to debate my categorization. My main problem with the LotR has always been with the orcs and the Uruk-hai. Sure, the story needs a source of villainy, but can a creature be truly born evil? Spiders aren’t evil. (Though some Tolkien fans might argue differently.) They’re actually beneficial. Likewise, while people can come from horrible backgrounds, that doesn’t mean they all turn out bad. Not to be confused with the show Supernatural. I’ve never seen it, and honestly, I never plan to. For me, this category is the most disturbing of all. They don’t just affect the body, but the soul. One particular duology my sister is obsessed with is the Monsters of Verity. The first book, This Savage Song, is filled with three monsters, the Corsai, the Malachai, and the Sunai. And one of the main characters, August, is Sunai who just wants to be human. While the first book is dark, the second book Our Dark Duet is even more so. Though I may not agree with all views in the book, it is an interesting exploration of what it means to be human and what it means to be a “sinner”. But the monsters don’t stop there. Even at age seventeen, the dementors from the Harry Potter series creeped me out. There’s no way I could have read that book when I was thirteen. Perhaps the most terrifying of all fictional monsters was Tash from The Last Battle. When I was a kid, my family and I liked to listen to the radio drama versions of the Chronicles of Narnia. One night, when I couldn’t sleep, I decided to listen to music on my MP3 player. Unfortunately, it was on shuffle, and I just so happened to wake up to the scene where Tash came in. Listening to that part during the day is creepy enough. I didn’t sleep the rest of the night. Do monsters belong in fiction? I’d have to say, yes. Often, creatures may point out the monstrous in ourselves. The main concern is the level of fascination. How does one read about monsters without becoming obsessed them? Like with any fiction, some discernment is required. Before you hand a book off to a child or friend, know their maturity levels. And don’t be afraid to talk about the book’s content. Again, these categories are not definitive. After all, how would you classify werewolves, and are they animal or humanoid? Often when it comes to monsters and fantasy, they blend the familiar into something entirely new. For a good example of a book that attempts to classify animals in a particular fantasy world Fantastic Beasts and Where to Find Them is a good example. Looking for more monstrous books? Other monsters not mentioned in this post include, but are not limited to the Fae in Jonathan Strange & Mr Norrell (long but worth it, historical fantasy), the yellow spotted lizards in Holes (not a creepy book, MG contemporary), Grievers in The Maze Runner (semi-creepy, YA dystopian), the Satan and his demons from Paradise Lost (classic literature, poetry), the demons from This Present Darkness (supernatural thriller), and the Sheolites from The Remnants trilogy (YA dystopian/fantasy). Let’s chat! Which is your favorite monster from fiction? Are there any I left out? What’s your take on monsters? Film references: The Water Horse, The Hunger Games, The Lord of the Rings, and Supernatural. Literary references: Maggie Stiefvater’s The Scorpio Races, Patrick Ness’ A Monster Calls, Mary Shelley’s Frankenstein, Suzanne Collins’ The Hunger Games, J. R. R. Tolkien’s The Lord of the Rings, Victoria Schwab’s Monsters of Verity duology, J. K. Rowling’s Harry Potter series and Fantastic Beasts and Where to Find Them, C. S. Lewis’ The Last Battle, Susanna Clarke’s Jonathan Strange & Mr Norrell, Louis Sachar’s Holes, James Dashner’s The Maze Runner, John Milton’s Paradise Lost, Frank E. Peretti’s This Present Darkness, and Lisa T. Bergren’s The Remnants trilogy. Ooh I LOVE monsters in books! The more the better, please.😂 I definitely love the ones in This Savage Song...they were like a bit familiar to other types of monsters, but also quite unique, which was exciting. And the Grievers were terrifying (particularly in the movies) and omg still freaked out over he Game of Thrones monsters. And in Nevernight there's some really terrifying worms in the library (wow bookworms...have a new...meaning😂) and I love it!